On 2 Friday nights ago, the little girl woke up in the middle of the night a few times looking uncomfortable. She was like this going into Saturday morning. We were hoping she could sleep it off. But no. Her heart rate were quite high and she has a fever working up. Her sats also wasn’t too good. She is struggling to maintain it at a healthy level despite suctioning and O2 being supplied. We were reluctant to check her into the hospital after the previous cross infection scare we had. But we were sort of worried that she suffered an infection again and had to make sure she is fine, plus she has been like this for a few hours. We were afraid that she may deteriorate further. For the first time, we left home with Kaelyn and her equipment in tow. We have not tried leaving the house with the equipment before. So It was a mess with the tubes and cables. Yes. Daddy didn’t do a good job of ensuring things are tangle free. I will do better next time. We got into the children’s emergency. They did their thing, IV drip, oxygen, X-rays and blood samples. We got checked into the ward with Kaelyn still crying hard. She did calm down after a while. 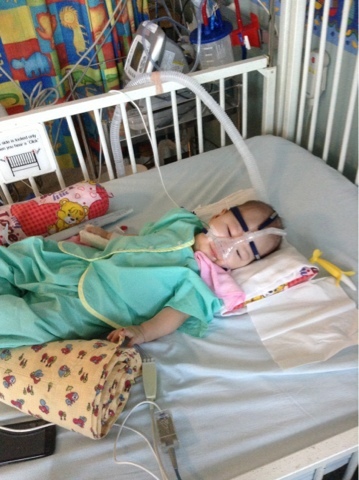 In 2-3 hours time, she was actually back to her normal baseline condition. No fever, heart rate normal and in her playful mood, which is good of course. However It left us puzzled as to why she behaved this way. Maybe 2 weeks of being coup up at home was too much for her. The weather on weekend were bad so we had no chance to bring her down to the park to breathe in fresh air. She got a staycation but she forgot she had to go thru the prickings and the IV drips.